Signs that the emergency may be settled for Ambode ended up obvious after a gathering held a meeting to deliberate on the rift between the two pioneers, and was attended by President Buhari and top APC governors. This was at the mega rally for APC’s aspirant in Saturday’s Osun gubernatorial election. The party’s leadership was said to have pleaded with Tinubu to let go of his grievances and allow Ambode return for a second term. It was learnt that former governors of Osun and Ogun states, Chief Bisi Akande and Aremo Segun Osoba, started the peace overture, as they led Ambode to entreat the national leader. The two advocates then led Ambode to Osun State Governor Rauf Aregbesola, who is perhaps the closest loyalist of Tinubu. On the advice of the former governors, Ambode was said to have prostrated pleadingly, while the Osun governor expressed his grudges and those of Lagos party members. He also explained why the members insisted they wanted Ambode out. One of the sins Aregbesola noted was Ambode’s alleged moves to destroy his (Aregbesola’s) political structure in Lagos West, especially in Alimosho area of Lagos. He said Ambode kept him waiting for several hours when he visited the Lagos government house. He further accused Ambode of vindictiveness towards party members that aided his emergence as governor in 2015. 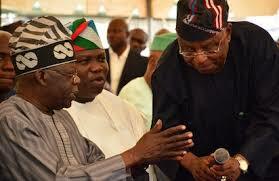 Aregbesola however reportedly promised Akande and Osoba that he would look into the matter. Unable to hold his emotions, Tinubu burst into tears, at which point, Buhari stood up, moved closer to Tinubu, and implored him to give Ambode a second chance. Consequently, Tinubu called for a meeting of the Governors Advisory Council (GAC), the outcome of which would determine Ambode’s fate. Before the Osogbo meeting, pointers that the crisis could be resolved in Ambode’s favour were already in the public domain, as some APC members cautioned that the party could be stretching its luck too far, if it denies the incumbent a ticket. Another signal a resolution would be struck before next week’s primary was yesterday’s return by contractors to some road project sites in the state. Work had stopped as soon as news broke that Tinubu wasn’t backing Ambode. The Guardian could not reach Akande or Osoba to confirm their role in resolving the matter. Also, the party’s spokesman in Lagos, Mr. Joe Igbokwe, confirmed that the GAC meeting would hold but denied knowledge of the Osun peace parley.